EXIT THROUGH THE GIFT SHOP is a chaotic trip through low-level criminality, comradeship, and incompetence. By turns shocking, hilarious and absurd, this is an enthralling modern-day fairytale... with bolt cutters. This is the inside story of Street Art—a brutal and revealing account of what happens when fame, money, and vandalism collide. 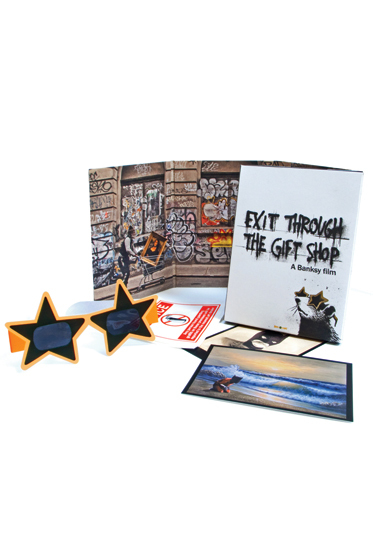 EXIT THROUGH THE GIFT SHOP follows an eccentric shopkeeper turned amateur filmmaker as he attempts to capture many of the world's most infamous vandals on camera, only to have famed British stencil artist Banksy turn the camcorder back on its owner in one of the most provocative films about art ever made. B Movie – an exclusive film about the ‘art’ of Banksy. A Star is Born – a featurette covering Mr. Brain Wash’s first installation..
Life Remote Control (Lawyer’s edit) – the movie that started it all, released for the first time.